Breaking away from routine, spending time with family, cooking on the outdoor kitchen countertop, and dining is an unforgettable experience. 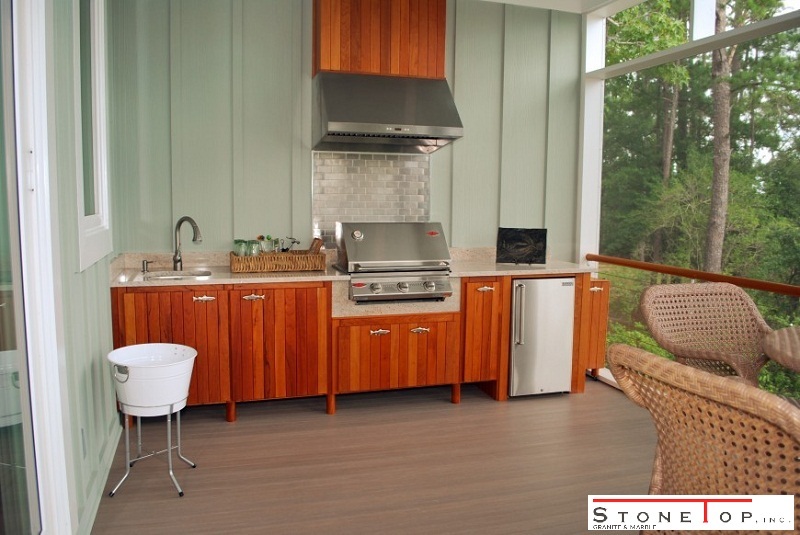 Not everyone will have this advantage as most homes do not have an outdoor kitchen. If you are thinking of installing one for your home, here are some ideas to understand how to go for it. Before you start building a countertop develop a plan on paper about how it should look in the end. Every detail starting from the shape and size of countertop to the things to be housed (wash basin, stove, freezer, etc. ), needs to be planned. A frame provides the foundation to install kitchen accessories as per plan, whether it is about keeping the washbasin to the left, perching oven on the countertop surface, installing cabinets below the oven, and so on. The frame can be built using wood or bricks, latter packed with mortar. Prior to installing countertop surfaces, claddings, and cornerstones, under surface foundation need to be developed. Start with nailing waterproof plywood and steel mesh sandwiching the builder’s felt comes the turn of cement mortar that holds the tile surface. Make sure to prep the mortar with grooves for the tiles to set firmly. As your countertop sits outside the home you need to make sure that the right countertop surface is used. As a surface such as plywood may not last long bearing the moisture and microorganisms you need to get something resistant to environmental agents. Granite, marble, slate, ceramic, or porcelain tiles are some of the surfaces commonly used. However, if you are installing the countertop in an open area, make sure to use a resistant countertop and also seal it properly. Here are tips to choose the right countertop surface for outdoors. A granite countertop on your kitchen surface means less maintenance troubles as the stone won’t easily yield to scratches or stains. Regular cleaning using hot water must be enough to keep it looking great. Even though this natural stone looks amazing in your garden, you need to seal it against stains and scratches. It is a perfect party material for every outdoor celebration bringing a wow feeling. Light on your pockets, these slate stones look good as well in your outdoor kitchen. These stones vary in colors such as copper, honey tan, golden green, and gray, and impart softness to your countertop. As they are soft, stains are common occurrences. Having them in your kitchen means, need for greater precaution with heavy objects. Available in attractive colors, these tiles come with unlimited patterns. Able to resist minor scratching forces they feature as yet another cheaper alternative for your countertop surface. But if they get damaged they are sure to look ugly as under surface with different texture crops up. With a hardness ranging from 5-9 porcelain tiles show an extreme hardness overtaking quartz. Developing scratch on its surface is nearly impossible, but if a dent appears, the uniform undersurface conceals it. Porcelain tiles are fantastic choices for outdoor purpose as they also fare well in terms of looks.